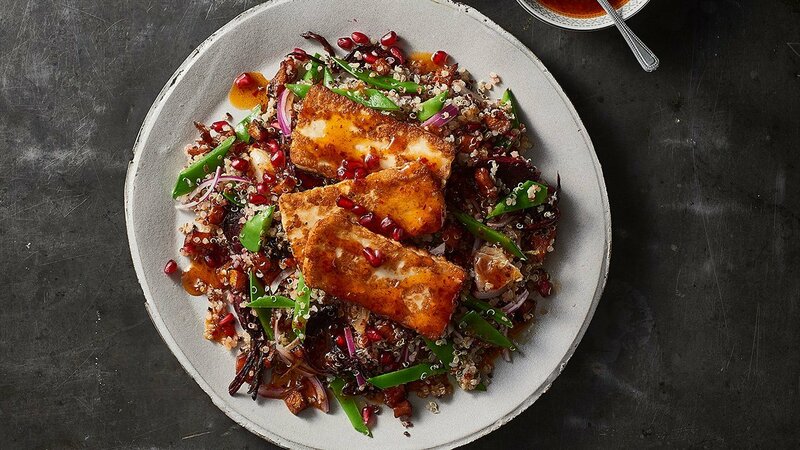 Cyprus originated cheese, meets Bolivia grains and then dressed with Thai flavours in this bright, colourful, flavoursome salad. A must try on every menu. Cook quinoa until soft - drain and rinse. Roast the pumpkin, beetroot, carrots and onion until just coloured. Pan fry the Halloumi until crisp and coloured. Take a bowl and mix all ingredients minus the pomegranate kernels. Fan the Halloumi on top. In a small bowl mix KNORR Thai Sweet Chilli, oil and KNORR Lime Powder. Drizzle over salad and garnish with pomegranate seeds.